ConservativeHome's Interviews: Any questions for Kulveer Ranger? Any questions for Kulveer Ranger? Kulveer Ranger is the new Vice-Chairman of the Conservative with responsibilities for Cities. He was born in Hammersmith, London in 1975. Educated at Latymer Upper School he went on to study University College London, where he graduated with honours in Architecture. He has a business diploma from Kingston Business School. Kulveer has worked as a management consultant for 10 years. His work has concentrated on delivering major projects in key public services. He has built a strong reputation in industry for his effective management and communication skills. Kulveer’s experience working with major organisations relating to transport and regeneration has informed his political thinking, specifically in city environments. At the last General Election Kulveer stood as the parliamentary candidate for Makerfield against the Labour incumbent Ian McCartney. He built on this experience in the 2006 Local Elections when he stood in Hounslow, increasing the Conservative vote in his ward by 40%. Further to this Kulveer has been extensively involved in the Conservative Party. He has been an advisor to Alan Duncan (Trade & Industry) and Dominic Grieve (Diversity). He was a member of the Quality of Life Policy Review Group and he has been appointed a Champion of the Conservative Women’s Organisation. 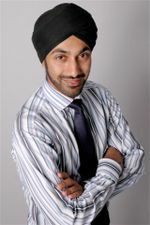 Kulveer has been involved in a number of other groups, helping to advise and build support for the Conservative Party. He has also written several papers for political think tanks. If you have any questions for Kulveer please leave them in the thread below.